When you think of Las Vegas, you think of slots, poker, blackjack, and live entertainment, all wrapped up in the requisite glitz. You should also be thinking about golf, since Sin City is home to some fantastic courses, and the weather is hard to beat in every season but summer. Check out this list before you take a break from the casinos and hit the links on your next trip to Las Vegas. The Aliante Golf Club course plays a testy 7,022 yards from the back tees and is highlighted by often tortuous bunkering and trees not considered indigenous to the desert, including pear and purple locust. The bunkers are strategically placed to complement the rocky arroyo that comes into play on 14 of the 18 holes. 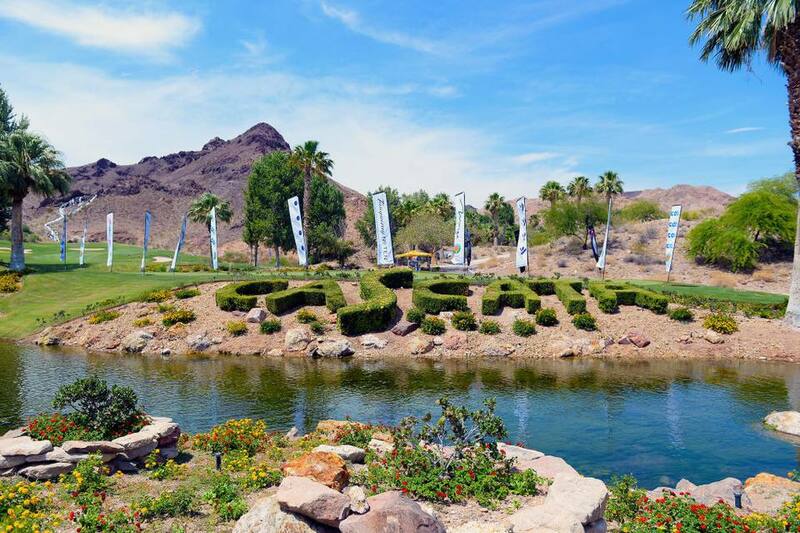 The Arroyo Golf Club is nestled between the spectacular landscapes of Red Rock Canyon, one of Las Vegas' most famous natural landmarks, and panoramic views of the Las Vegas cityscape. The Arroyo Golf Club course is a blend of innovative design, great natural beauty, strategic bunkering, dramatic water features, and the stark contrast of lush emerald greens against the blinding desert terrain and mountain backdrop. The 18-hole Golf Course at ​Paiute Golf Resort Las Vegas plays 7,604 yards from the tips for a par of 72 and is the longest course in Nevada. The course rating is 76.3, and it has a slope rating of 149. Designed by Pete Dye, the Wolf Golf Course opened in 2001. It's known for its beautiful island green on the 15th hole. The 18-hole Cascata course in Boulder City, Nevada, about a half hour's drive from Las Vegas, plays 7,137 yards from the longest tees for a par of 72. The course rating is 74.6, and it has a slope rating of 143. Cascata was designed by Rees Jones and opened for play in 2000. Canyon walls and rock outcroppings make Cascata a memorable golfing experience. The 18-hole layout at Black Mountain Golf & Country Club in Henderson, Nevada, features two separate 9-hole courses: the Founders Nine and the Horizon Nine. Black Mountain also has a driving range and chipping and putting greens. The 18-hole Las Vegas National course is right in the center of Las Vegas and a convenient choice if you're staying on the Strip. 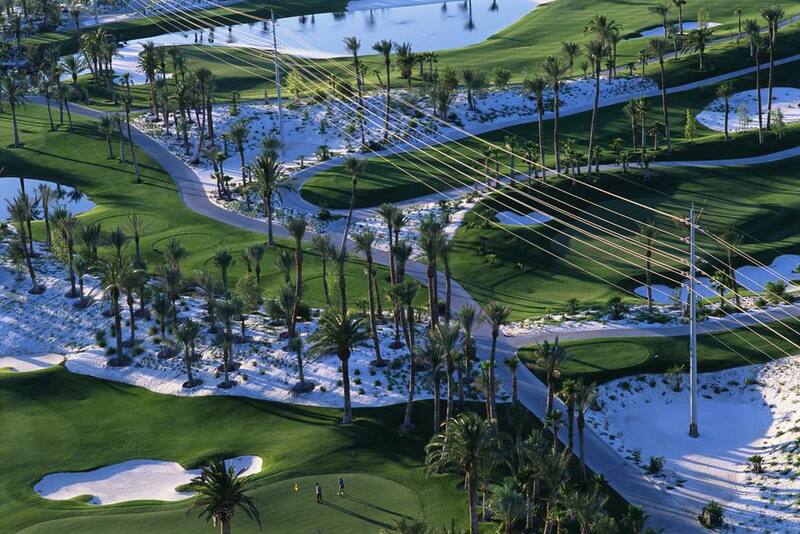 It's a traditional course with many trees and lakes, a real green oasis in the desert landscape of Vegas. It plays 6,815 yards from the longest tees for a par of 71. The course rating is 72.1, and it has a slope rating of 130. Las Vegas National was designed by Bert Stamps and opened for play in 1961. Golf Summerlin Las Vegas has three courses in the area, all designed by Billy Casper and Greg Nash. Highland Falls, Palm Valley, and Eagle Crest offer a range of experiences for golfers of all skill levels. Shadow Creek is part of MGM Resorts International, so if you're staying at one of these resorts, you have a pass for Shadow Creek from Monday through Thursday. Weekends are reserved for high-rollers. Yes, it's exclusive, and a bucket list item for serious golfers. Shadow Creek, designed by Tom Fazio, is ranked No. 17 on Golf Magazine's Top 100 list. Coyote Springs Golf Club, about an hour from Las Vegas in Coyote Springs, spreads out across a green valley in what's being developed as a planned community that includes parks, bike trails, town centers, and entertainment. Golf legend Jack Nicklaus designed the Coyote Springs golf course.